Bangkok (Thailand) – August 17, 2018 (travelindex) – The Tourism Authority of Thailand (TAT) organizes an activity to invite general public to join TAT Gift (Gives) for Local to create a network of local community lovers as part of TATCSR activity. This activity is sharing the power of giving by voting people favorite community that they want to give an opportunity and support for development on the website. In addition, one of the participants will be able to receive a great chance to win the special prize. The communities which receive votes will get the opportunities to develop their areas through the community activities of TAT in the future. Top three winning communities will be on the list of communities that Social Giver will continue to develop their areas. 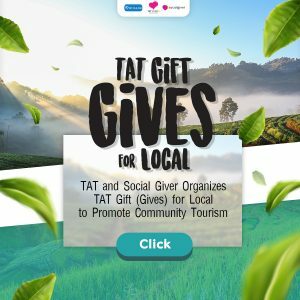 TAT truly expects that this activity will encourage general public to develop tourism and enhance the value of tourism in the communities in order to generate income for local community economy according to government policies.